Students will participate in a band class (period 1,2, or 3) playing the orchestral percussion instruments with the wind instruments. During the class, students will develop fundamental technique on all percussion instruments, note and rhythm reading, and participate in percussion ensembles. All three band classes are UC credited class. Audition is required for Symphonic Band and Wind Ensemble. This class is a ninth period class where students will perform for school events such as football games, rallies, as well as competitive parades. Any student who is interested in being part of the marching band strong recommended to attend the summer rehearsals. Auditions are not required to be part of this group. Any level of musicians are welcome. Battery - Marching snare drums, tenor drums, bass drums, cymbals, and toms. Battery section will be participating at parades. Front Ensemble - Mallet instruments such as marimba, xylophone, bells as well as timpani, drumset, guitar, synthesizer and auxiliary instruments. Front ensemble section will perform at half time show home football games. Parade Drummers - Marching parade snare drums, bass drums, and cymbals. Students will partipate in a parade rehearsal once a week with winds. This is an auditioned based advanced drumline group (battery and front ensemble). This group will participate at Southern California Percussion Alliance and Winter Guard International competitions on Saturdays. This group is open for all students who is interested in playing drums or front ensemble. This ensemble will perform at on campus activities and any community performances. Students will learn fundamental technical and marching skills. This is an auditioned based advanced percussion ensemble group (front ensemble instruments only). 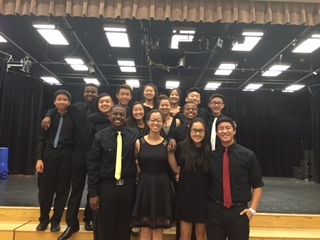 This group will participate at Southern California Percussion Alliance and Winter Guard International competitions on Saturdays.